Hands up all you anti-Valentiners, single or not, here’s something everyone should be able to get behind. El Paso Zoo in Texas, US, is offering people the opportunity to name a cockroach after their ex. The kind zookeepers will then feed said cockroach to a family of ravenous meerkats on Valentine’s Day. Welcome to 2019! It’s kind of like voodoo, but without all the witchcraft and more of a funny anecdote to tell people. The zoo have dubbed the idea ‘Quit Bugging Me!! !’, and invited their followers to send them a message on Facebook with the name of an ex they’d like to see live briefly as a cockroach, before being scoffed by a meerkat. Names will be displayed on our meerkat exhibit and on our social media started Feb. 11th! Watch live Feb. 14th at 2.15pm on Facebook or our meerkat webcam to see our meerkat mob crunch down on these little bugs! That’s right, you can watch it all go down live and in real time as the meerkats take a break from flogging insurance to eat your ex’s namesake. What’s the perfect Valentine’s Day gift? Naming a cockroach after your ex, of course! Message us your ex’s name and we’ll name a cockroach after them! This is a fun way to get the community involved in our daily enrichment activities. 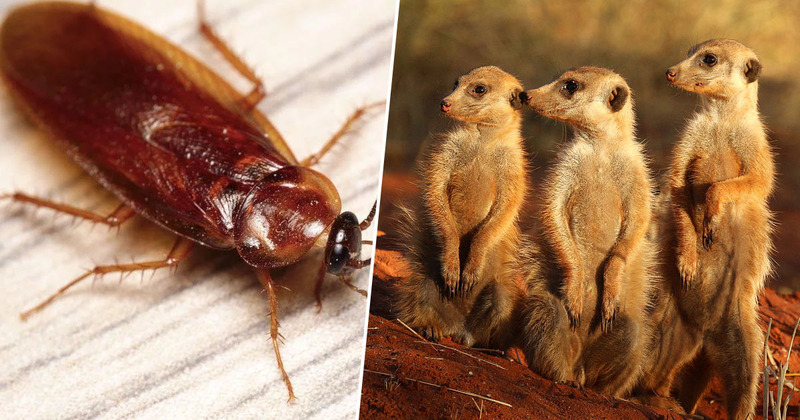 The meerkats love to get cockroaches as a snack and what better way to celebrate Valentine’s Day than by feeding them a cockroach named after your ex! Going along the same anti-Valentine’s Day/punish your ex lines, the Wild Life Sydney Zoo in Australia is giving people the opportunity to name a snake after their ex. Because snakes aren’t as – apparently – disposable as cockroaches, you’ll have to fill out a form and persuade the zoo why your ex is the snakiest person who truly deserves to have a reptile named after them. If you manage to persuade them (you can find the form here), the zoo will give a brown snake – one of the world’s most venomous snakes – the name of your choice. Entry closes on February 13, with the winner being announced the following day.